As a leading social media management tool, Facelift attaches great importance to high-quality, innovative partnerships. In line with our best-of-breed approach, we work exclusively with state-of-the-art solution providers who are the best in their respective field. We want to meet the highest quality standards even when it comes to our partner products. The current Forrester Wave™ study on “Social Listening Platforms” (Q3 2018) confirms that Facelift BBT is working with the best in the industry. Using solutions from companies such as Talkwalker, Brandwatch, and Linkfluence, we proudly provide our customers with the opportunity to professionalise their social media monitoring. Why Are Social Listening and Monitoring so Important? 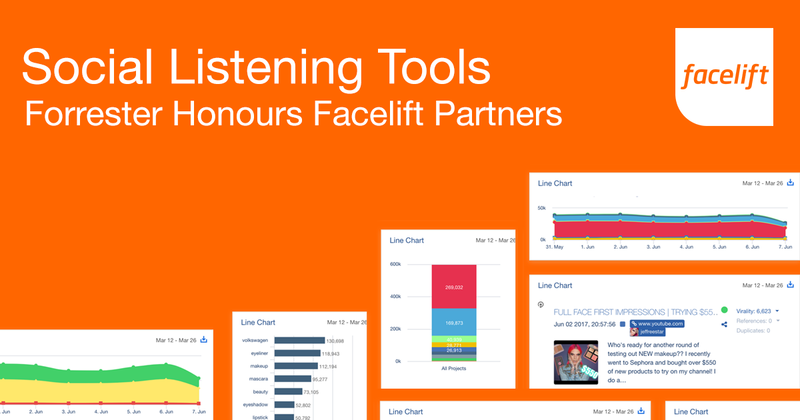 Social listening is much more than just tracking @mentions and comments about your own social profiles. In particular, it is about understanding how one's own brand is perceived away from one's own channels. By analysing this kind of communication on websites, news pages, blogs, forums, etc., you will learn how your own brand or products are being talked about as well as how you are positioned in comparison to your competition. This provides important information and insights that you can profitably use for sales and marketing purposes. Much like global brands and agencies, Facelift trusts in Talkwalker: The social listening tool from Luxembourg monitors social media, print, news sites, blogs, forums, radio and TV stations in 187 languages and also offers excellent image recognition and sentiment analysis. Forrester praises this flexible product for its broad data access, its sophisticated data engine, and advanced analysis capabilities through its Quick Search feature. It is not for nothing that the social listening tool has been awarded the "Strong Performer" title. Above all, Talkwalker is praised for its data quality, reporting, and data processing. Anyone that wants to take a detailed look at one’s own brand image and reputation should consider Talkwalker. Brandwatch, headquartered in Brighton, has also received Forrester's "Strong Performer" award. With its three products, “Analytics,” “Vizia” and “Audiences,” the tool provides extensive social listing support for digital channels such as social networks, blogs, forums, review platforms, and news sites. Forrester is particularly enthusiastic about Brandwatch's really clear and self-explanatory user interface. In addition, the tool is praised for its customer strategy, which puts the customer at the centre. With its excellent customer support, Brandwatch is ideal for brands and marketing professionals looking for a well-trained service team. Linkfluence's social data intelligence platform includes Radarly, a social media-monitoring platform, and Linkfluence Search, a search engine designed to quickly discover market trends and brand insights. The outstanding data quality is rated particularly highly. In addition, the tool has helped many major clients enter the Asian market through a direct partnership with Sina Weibo in China. Customers are enthusiastic about the extensive benchmarking that this social listing tool offers. Linkfluence is recommended for those interested in quickly and easily researching their own brand image. If you want to learn more about how your company communicates, simply arrange for a personal demo with your Facelift Cloud Account Manager today.